Stop the worlds, I want to get off. Erin Macdonald at the Future Con panel titled "Parallel and Multi-Universe Theory in Sci-Fi." 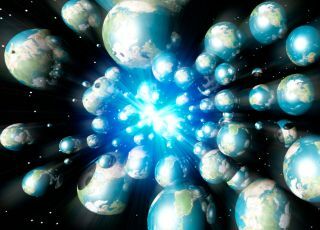 Multiple universes might also exist within contained bubbles of space-time, a concept explored in the video game "Bioshock Infinite." By this reckoning, inhabitants of two universes could theoretically interact should their "bubbles" connect to each other directly, according to Macdonald. Quantum universes appear more commonly in sci-fi, Macdonald said. This idea suggests that every decision a person makes spawns a new timeline, creating a new and self-contained universe that follows a different path. Science-fiction writers crafting time-travel stories frequently invoke the rules of quantum universes to explain how characters can travel to the past and not erase their own existence — their every choice births new universes entirely, leaving the universe that was their origin intact. But perhaps the most disturbing premise of all is whether the universe we perceive as real is, in fact, a simulation of some kind, as in the movie "The Matrix." "Would you want to know if you were a simulation, but had no control? Could we test if we were in a simulation if we were all just code?" Macdonald asked the audience. For now, plenty of questions remain unanswered — about multiple universes and the reality of our own, she said. "None of these can be proven — but they're fun to think about," Macdonald said.